Last week Hurricane Matthew hit the shores of Florida. By 11 a.m. EST on Saturday more than one million residents were left without power. Four people were dead: two people killed by falling trees while in their home and camper, and an elderly couple died from carbon monoxide fumes from the gas generator they were running in their garage. In Haiti the damage from Hurricane Matthew was far more intense: over 800 dead as of this writing. My friends, natural disasters do and will happen, and there’s nothing we can do to stop them. You can call prepping for war, economic downturns and zombie apocalypses “paranoid” but the threat of natural disasters such as hurricanes, tornadoes, droughts, heavy rains and massive snowstorms are real and they happen regularly. This is why it is vital for EVERYONE to prepare for the natural disasters that are prone to happen in the area where they live. For instance, if you live in Oklahoma you may be safe from a hurricane but at risk for drought or tornado. Us Minnesotans have had our share of tornadoes and nasty thunderstorms as well, and there’s been instances of debilitating snowstorms that leave people stranded for days – especially in rural areas. Since we know that natural disaster DO happen and they’re uncontrollable by man (there are conspiracy theories on this too but I won’t go there today 🙂 ), it’s just plain stupid not to prepare for them, especially in due season. Here are some tips that nearly anyone can follow in order to prepare to be safer during natural disasters. A weather radio will help you stay informed even when you’ve lost power. Another part of staying informed is always being in “search and scan” mode. Search and scan mode means you are constantly working to stay alert of the activities around you, whether they be weather activities, the activities of animals (animals have a keen weather sense and will behave differently when bad weather is coming) and the behavior of people. Honestly, teaching yourself to always be in active search and scan mode will help you prepare for any disaster. How can you teach yourself to learn to be in search and scan mode? It’s pretty simple: just work to train your mind to develop the belief that danger is always lurking and needs to be watched out for. Need some examples? Buy The Bourne Identity (Widescreen Extended Edition) . Jason Bourne really has the search and scan mindset down in a BIG way and you can learn lots from him. Another part of staying informed is knowing how to properly work the equipment you have that’s meant to keep you safe. Carbon monoxide poisoning from generators is not unheard of, yet most all generators have explicit instructions in the user manual on how to avoid carbon monoxide poisoning from your generator. I can’t stress this enough. Many natural disasters result in a lack of basic necessities. The news reports about Hurricane Matthew hitting the shores of the East Coast included lots of video of empty grocery store shelves. You do NOT want to be the guy (or girl) running to the store in a last-minute panic because there’s no food, water, medical or personal supplies in your house. That guy has to fight frightened crowds and lacking supplies in hopes that he might get what he needs for his family. Instead, choose to be the guy who doesn’t have to go to the store because he’s got an ample supply of all his stuff at home. Here are some stockpiling size recommendations. These articles will help you to stockpile in a way that minimizes waste (both food and money) and help you to have a stockpile where you can not just survive, but thrive. For staying warm during a power outage in cold weather. A generator is the smartest thing to do because it will help you to avoid freezing pipes in the house but cold-weather sleeping bags will help you to be able to keep heat levels lower, reducing the amount of gas or propane you’re using from your generator. Great Christmas gift for a prepping or camping loved one! Also: To keep the food in your fridge or freezer safe during a power outage: Number one, don’t open it. If you keep your fridge and freezer closed during a power outage, your food can stay safe for up to several days. Make sure that the transfer switch kit you choose is compatible with the amount of watts your generator can supply. Decide this well ahead of time. Do you have a cabin? Relatives that live further away? Hotels you’re familiar with within a one, three, five and eight hour distance? Do you have a camper that you can hook up and drive to a far-away campground? Do you know where campgrounds are in neighboring states or far away from your home? Establish your bugout place options well before a disaster hits and decide where you’ll go in the event of each specific disaster. Often times disaster hits when the kids are at school and hubby and wife are at work. In the event that cell phones don’t work, it’s important to have a “connect” plan. Know who will pick up the kids and where you can meet if you can’t communicate at all. Again, it’s vital to figure out potential scenario plans beforehand in case a natural or other disaster comes unexpectedly and there’s no time to make an immediate plan. Never let gas tanks get below 50%. 75% is better. In times of evacuation, there’ll be long lines at the pumps – if the gas stations are even open and operable. Don’t be the guy or gal who is stranded at home or work because your gas tank is too near “E” and you had “planned on” filling up after work. Keep the tank at a minimum of 50% full at all times. any medical or toiletry items that are necessities such as toothbrushes, a roll of toilet paper, etc. Again, make sure to have your bugout plan established well in advance so that it becomes a quick task to get out of town if you need to. And know that part of having a solid bugout plan means your car is always stocked with an emergency kit. See How to Stock a Winter Car Survival Kit. Always keep cash on hand to buy supplies you might not have thought of. People generally are always willing to take cash, even in the event of a natural disaster. If you have pets, bugging out is going to take some extra thought. If you’ve got a dog or a cat, you’ll likely just bring them with you. Make sure they have their own bugout bags with food, litter, treats, any meds, etc. If you’ve got more animals than you can take with you, you’re going to have to decide if you want to leave them or stay with them. If you decide it’s in the best interest of your family to leave them, do the very best you can to be sure they have adequate shelter, food and water before you go, and get back to them as quickly as you safely can. I hear stories over and over about people who disobeyed law enforcement’s directives to leave an endangered area. Friends, there are many things wrong with this plan. First, you put yourselves in danger. Second, you put in danger the lives of emergency crews who have to rescue you when the disaster becomes “worse than I thought”. Just recently we watched a documentary about the eruption of Mt. St. Helens in 1980. One couple they interviewed said that they chose against law enforcement instructions to stay in their home near the eruption site. Although they lived to tell about it, they both said it was stupid to ignore the evacuation order and that if they had to do it again they would’ve left. They both agreed that it was a terrifying time and that the risk of death to themselves and rescuers wasn’t worth it. You can endanger your own life if you wish, but don’t endanger the lives of local firefighter and rescue crews – they have families they want to go home to at night that need them. Don’t risk taking a loved one away because of your own foolishness. I may sound harsh here, but having a firefighter for a husband, it’s tough to see people risking the lives of rescue crews when they blatantly ignore repeated warnings. I hope and pray that this article helps you to be prepared for any natural disaster that comes your way. What suggestions do you have for preparing for natural disasters? Have you ever been caught in a scary natural disaster? Very good tips, Laurie! I think this is very important too. When Lucy and I lived in the Midwest we made sure to have a weather radio (to help alert us of tornados in the middle of the night…), we kept shovels, blankets etc in the car during winter and wouldn’t let my gas tank get to below 50% full, I also had an emergency escape kit handy in my car (to cut the seat belt and help break the glass on my side window) just in case. Call me paranoid, but I was prepared! Now living in Charlotte, the danger isn’t tornados or snow storms, but there are other natural disasters to worry about including hurricanes. We were definitely prepared for Hurricane Matthew for the chance that it may turn inland and hit us directly (like Hurricane Hugo years ago…). It happens! Love the idea about the emergency escape kit – I never thought of that! I didn’t know you guys were in Charlotte. We plan on visiting there within the next couple of years. It’s on our dream destination list! Excellent tips. It seems that the natural disasters are more and more common and are more destructive. I feel kind of complacent since we aren’t usually affected by natural disasters…but you never know and you have to always be prepared. It really is crazy when people don’t obey mandatory evacuation orders. I read that some guy decided to stay, and then had to call for help when his roof came off! He’s putting his life as well as rescuers in danger. I’ve heard those stories too. Many people think they’ll be able to weather the storm, so to speak, and then it doesn’t turn out that way. 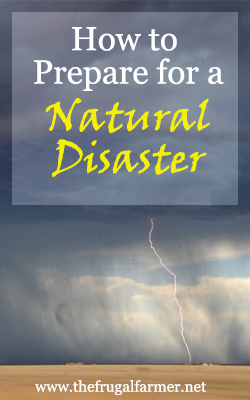 Great tips on how to prepare for a natural disaster, Laurie! Thanks for sharing. I realized we have a little work to do in this area. We live in Iowa so, typically, our greatest risk is tornadoes or a huge snowstorm (though we did feel an earthquake a few weeks ago!). 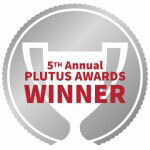 We are “diligent preppers”. We have enough food for 6 months, but not enough water and other supplies. One thing we do have is a water filter – the type made for back country hiking – that would help if we ran out of water (but we still need to work on stockpiling more of it). We also have a generator that we’ve had to use when we’ve lost power. We always run it outside to avoid the dangers associated with carbon monoxide. WOW! Didn’t know about that earthquake!! We are looking into generator purchases right now. We lose power a few times a year every year and in the country that can be scary. So smart to run generators outside only! Great tips Laurie! Always important to have a plan. We had our moments with hurricanes Irene and Sandy. Extended power losses, and two trees that came down on our house. We have a modest stockpile now. Cash and gas are two things we always make sure we have on hand when we know a storm is approaching. I have been through a couple of hurricanes that were pretty destructive. Been without electricity for up to 10 days. It was miserable, but nothing extreme where I had to leave home. Ice box and generator would be nice add to this list. I have to admit being in the DC area we haven’t been hit with a natural disaster unless you consider the politicians and lobbyist that arrive each year. I know I need to better prepared in case something does happen. I will definitely being using your list for the future. LOL, funny. 🙂 Definitely a natural disaster that needs cleaning up. 🙂 Glad to hear we’ve got you thinking. Prepping is good! These sort of blog posts stress me out – I have so much work left to do! I really think the best thing people can do is make sure they have water and a plan for what they will do if they are out of power and/or stranded for a few days (or longer).